Today as I was reading the usual A year with Rumi book, I cheated, pop. I skipped June 19, 20, and 20 to peek at June 22, your birthday. I wanted to know what he writes for June 22. And I felt my eyes watering. I know you have moved on and I won’t be the one who holds you back. Yet I also know you are always be here for me. Because we are always one. United. Connected at the roots. With you cheering at me. Praying. Glowing. With God’s love. I miss you so much, especially at times like this. I love you. And wish you well. This entry was posted in family, personal, quote on August 31, 2007 by Eva. Have you ever gone out of a mall, looked at your parking ticket and found out that you have spent about three hours and ONE minute. Which means that we have to pay an extra hour for that one minute. Annoying (to me). And on those times, my impatience shows its ugly face. So when I am in a certain mood, I would rush to ensure that I do not have to pay that extra minute. Unnecessary, I know. So earlier tonight I deliberately train my patience. In the gym, I glanced at the clock, I knew it was going to be tight. So I consciously slowed down. I locked my locker carefully. I took my time in drying my hair. There was an instance when I lost that rhythm. Suddenly when I was about to open my locker, I took the wrong key. I realised this and I returned to the rhythm. Aware. The parking ticket was in my car key wallet and I deliberately did not even take a peek at it. I walked slowly to my car. Went down on the escalator and did not try to speed up my walk. I got into my car and drove to the exit gate. Only when I was near to the gate, I took out the parking ticket and looked. I went in at 19:44:53. I came out at 21:43:59. God really does have great sense of humor. This entry was posted in occasion, personal on August 27, 2007 by Eva. This is one of the things that I like about Indonesian language. There are several words we use when referring to friends. There are “teman”, “kawan”, and there is “sahabat”. Every Indonesian knows where the difference lies, although not most people probably have a hard time giving the exact definition. But that is the way it is. We use the word “teman” very lightly. I want to you meet my “teman”. 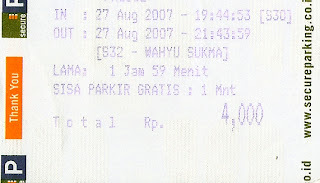 My high-school “teman”, my work “teman”, etc. But we use “sahabat” very carefully and selectively. Why, I asked. 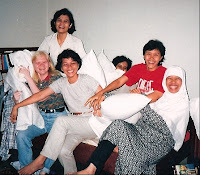 She said, “Because you seldom refer to a person as a “sahabat”.” Much less a group of people. I did not even realise that habit until that moment. That’s true. But the ones whom I was telling her about were indeed my “sahabat”. My friends for more than fifteen years, who have seen all the changes that I have gone through, my ups and downs, and yet they have stuck around me all these years. Those who just smile and give a “whatever” look when I am in one of those moods, when I decide to do something odd (which is probably more often that I want to admit). The 91 girls. Here’s to a lifetime of rollercoaster ride, here’s to a life long friendship. Love you all to bits. This entry was posted in friend on August 27, 2007 by Eva. This got me curious. Yes, why is that? So I accessed my previous blog and started reading. It was a bit overwhelming, actually, to read the blog one more time. It brings back so many things in mind, or rather, in heart. The most beautiful writing is when we write with our heart. And we cannot write with our heart unless we are in touch with it. That is why it was different then than it is now. When I returned from Spain, I told a friend it was easy for me to feel in peace while I was in Spain. The challenge is to keep that sensation, that state of heart, in the bustling busy city of Jakarta, in the midst of all the deadlines at work and issues with families, friends and the country. I told you (readers, visitors), that I felt like I am starting to write in a more contemplative mode again. I supposed that is my sanctuary. My escape when the soul is too tired of dealing with all the unnecessary things in life. When the signal to refocus is so strong. Just like you said, whichever road we choose to travel, we will always encounter problems. Different problems, but there will always be problems. Challenges that we need to overcome to help us grow. No use of saying “if I had done this, I would have..”. It is time to retreat to that state again, when I am in peace with myself, when I am in touch with my heart. And refocus myself to walk in my personal journey as a pilgrim for life. This time it is a step tougher though. This time, we do this in the midst of the bustling busy city of Jakarta, complete with all the deadlines at work and issues with families, friends and the problems faced by the country. I look forward to the time when I come to the realization, as another teacher said, that there will be a time when we do not seek solution for our problem anymore. Because life is one major solution on itself. This entry was posted in friend, occasion, personal on August 26, 2007 by Eva. It is funny to listen, to see you getting so excited over writing. Not funny, funny. But funny, happy. The kind of funny that brings a smile on my face and in my heart. I too share the same passion. To express myself in writing. Whenever I have a writer’s block when writing for my work, I always write in my blog first, to get the creative juice going. Whenever I feel sad or upset, I too write. But my way of writing is very different from yours, or any other people for that matter. Some people write serious stuff, political etc. Some write in a cynical way. Some write in a very poetic way. In an innocent child kind of way. My writing is very straight forward. I supposed you can learn a lot from a person’s written work. Not just from what he or she writes, but also from how he or she writes it. My writing? Straight forward. Yet sometimes full of symbols. Paradoxical. It is sad how reunion sometimes do not do justice for its true meaning: to come together again so as to be connected or to come into close association or relationship. Some reunions even causes the oppositve things. The committee for the reunion argues endlessly with one another over small matters when preparing the reunion. This happens even when a group of people get together for a good cause. (speaking from a rather personal experience.) Even with good intension in mind and an abundance of knowledge on spirituality (whatever that means), we can end up with endless arguments, resentments and negativities. Then re-union becomes de-union. Unfortunate. Unnecessary. Sad. This entry was posted in friend, occasion on August 26, 2007 by Eva. We talked about first impression. Last impression. I supposed it is a topic close to our heart, (professional heart that is, if there is such thing) since we are in communications field. People often talked about the importance of first impression. To me last impression is just as important. Last impression is more complicated than first impression though. Because is the sum of all the impression people gather from the first time they met us until the very last minute. It is probably an impression closer to the truth as well. Again, since it is the sum of all our actions and words, whose control has gotten looser as we are unable to keep our true personalities hidden. It is the lingering impression people keep in their head and most probably tell other people about. We all know how poisonous grape-vine can be. An actor is only as good as his last film. A writer is only as good as her last book.